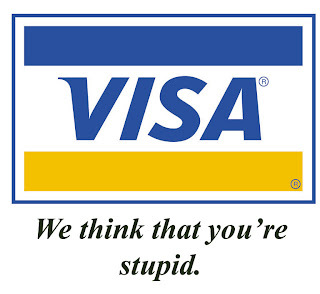 Bastardisms: Visa: An exercise in marketing B.S. Unfortunately, as the democrats are pushing socialism and dependance on government, I see the day when totally dependent US citizens will be issued "credits" with no other purchasing ability. Look for a big depression soon. Unlike "The Great Depression" where a large part of society was still agricultural (today < 2%), folks could at least grow food. 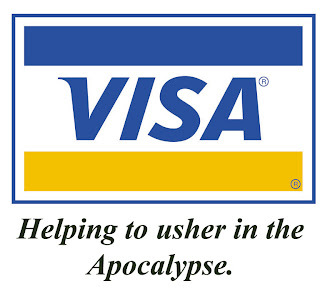 Its a reach but if I was a Hollywood producer and I had to come up with a storyline as a prequel to the apocalypse, VISA is leading the way.